Reconditioned unit: tested & under warranty. Netwave has taken all of the hassle out of bridge control with this remarkably easy to use bridge control unit. You’ll never struggle to understand bridge control again thanks to this unit’s direct function access and comprehensible approach to remote system diagnostics. Suddenly, everyone on board your vessel will be able to understand relevant data without the need for any special training. All they will need to do is view this unit’s bridge console, which continually displays clear and specific messages (via a dimmable dot-matrix display) about what’s happening within the S-VDR. With the assistance of this unit, your ship will never be needlessly detained again owing to a malfunctioning S-VDR component. 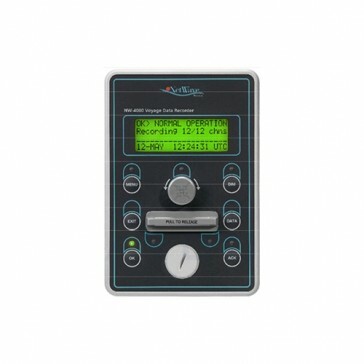 This Bridge Control Unit NW-4010 for Netwave sVDR constantly monitors for part faults so that you don’t have to. It also monitors system integrity, signal quality, and power analysis. You’ll also be pleased to know that you can use this unit as a user terminal. Configure automatic messages and day reports and send them through fast, reliable Satcom systems.